Ha’aretz is reporting this morning that overnight IDF soldiers killed a disabled 70-year-old Palestinian man when they demolished on top of him the “uninhabited” house in Khan Younis where he and his family lived. A wheelchair-bound Palestinian was killed as the IDF destroyed or seriously damaged a dozen houses in Gaza's Khan Yunis refugee camp in the early morning hours on Monday. The IDF claims the houses were uninhabited and used by gunmen to fire at the neighboring Gush Katif settlement bloc. Palestinian sources said that large numbers of IDF troops entered the west side of the camp with bulldozers, tanks and armored personnel carriers. 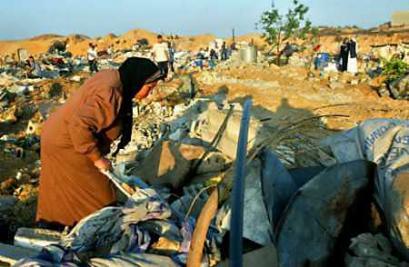 Around 4 A.M. the tractors destroyed a house in which Mahmoud Halfalla, 70, resided, Palestinian sources said. The wheelchair-bound man did not manage to escape from the house. After the IDF left the area, Halfalla's body was found in the wreckage, the sources said. Now, there are a few things I might query in the way that story is reported. Firstly, I think it was more likely a bulldozer than a "tractor" that demolished Mahmoud Halfalla's home. The IDF entered Khan Younis under cover of darkness to destroy Palestinian houses, not to plant vegetables. Secondly, as Mahmoud Halfalla is now dead, those houses were clearly not "uninhabited", regardless of what the IDF claims. And even if they were, doesn't it strike you as odd that, seeing as the Gaza Strip is the most densely populated piece of real estate on earth, and seeing that UNRWA is currently accomodating thousands of Gazan Palestinians in tents because IDF house demolitions in just the first 6 months of this year have left over 12,000 local people homeless, the houses that the IDF demolishes are so often "uninhabited"? Perhaps a little contextual information, on the lengths that the IDF goes to to make life unliveable in those areas it wishes to cleanse of Palestinians, so that they will "voluntarily" leave the homes that Israel wishes to destroy, might have been useful here. And finally, that headline's not quite accurate, is it? "Man crushed to death after IDF destroys home"? Unless Mr Halfalla was incredibly unlucky and happened to be crushed to death by an unrelated phenomenon shortly after the IDF demolished his home on top of him, it's probably more truthful to say "Man crushed to death while IDF destroys home"; or perhaps dispense with the passive altogether and just come out and say it: "IDF crushes man to death by destroying home on top of him". 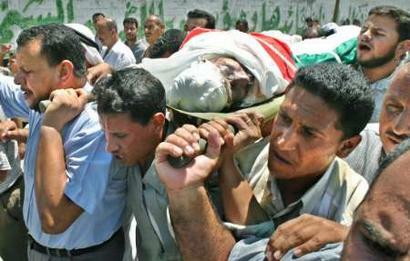 Masked Palestinian militants march during the funeral of two militants after their car exploded in Gaza July 11, 2004. (REUTERS/Suhaib Salem). (You can see the photo in context here). What exactly is Ha'aretz's angle here? "Oops, our army crushed to death an elderly, disabled, civilian but we really don't want you to think about that. So here's a scary picture instead of a masked man at a funeral who has no connection to this story and is not referenced anywhere in our report. LOOK A TERRORIST!". That's pathetic. Ha'aretz manages to run photos (and often pen portraits) of virtually every Israeli victim of Palestinian violence, and quite rightly so. Every person killed in this conflict should be humanised with a name and a face and a life story. So why not humanise the murdered Palestinians too, especially when its your own army that's killing them? It would have been easy to use a relevant photo: even a general picture of the destruction in Khan Younis (like those shown above) would have been OK. A photo of the victim himself would have been better journalism. Best of all, a serious newspaper might have provided some meaningful context by including pictures of other innocent people murdered in exactly the same way, like Noha al-Makadama (a.k.a. Nuha Sweidan) who was 9-months pregnant and asleep in her home with her husband and eleven children when the IDF destroyed their house, crushing her under a wall and also killing two boys, aged 13 and 16. I don't want to brag, but you have to admit that my photo is a lot better than theirs, inasmuch as it actually has something to do with the story. And it was easy to find too, seeing as it comes from the same Reuters that provided the "I'm-totally-unrelated-but-look-at-me-I'm-a-terrorist" photo that Ha'aretz actually used. All you need is internet access and Google. Oh, and the willingness to show that the victims of IDF atrocities in Gaza are human beings too, no more and no less than the victims in Ashdod and Tel Aviv and Sderot. Just one word, Thanks !.. a word which is worth a thousand words.